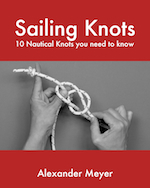 In this chapter I explain why a sailboat moves forward in the first place. People who are not interested in the theory can skip this chapter and start right away with the Points of Sail. 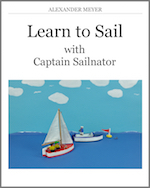 The question is: How does sailing actually work? Why does a sailboat moving forward? There are two acting forces: Thrust forward by resistance and thrust forward by lift. Imagine that you are standing on a surfboard with your back to the wind. Then you open a big umbrella in front of you. The umbrella offers resistance to the wind. The wind will push you in the direction it blows. This is thrust forward by resistance. The bigger the umbrella is the greater is the thrust. This happens to a sailboat too when the stern points into the wind and the sails are opened wide. Figure 10: Thrust forward by resistance. If you turn yourself a bit to the left or to the right the wind comes at an angle from behind. Even now the thrust forward by resistance works. With some skill you move forward with your board diagonal. If you turn yourself to an angle of 90 degrees to the wind you cannot influence the direction you will move towards any longer. The wind will pass by the umbrella without any effect. You will be pushed in the direction the wind blows again. You are drifting. Figure 11: Thrust forward by lift. At this point the thrust forward by lift comes into action on a sailboat. (Figure 11) The further the sailboat turns towards the wind, the more the sails have to be hauled. The result is an aerodynamic profile within the sails. From above it looks like the wing of an aeroplane and it works in exactly the same way. 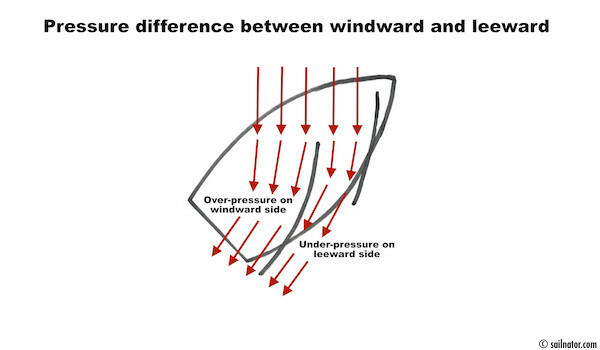 Figure 12: The difference in pressure windward the sail (over-pressure through deceleration of the airflow) and leeward (under-pressure through acceleration of the airflow) act as total force = lift. The wind flows along the sail. The airflow is prolonged on the windward side and accelerated along the leeward side of the sail. This creates over-pressure on the windward side and under-pressure on the leeward side and acts as total force in the same direction. 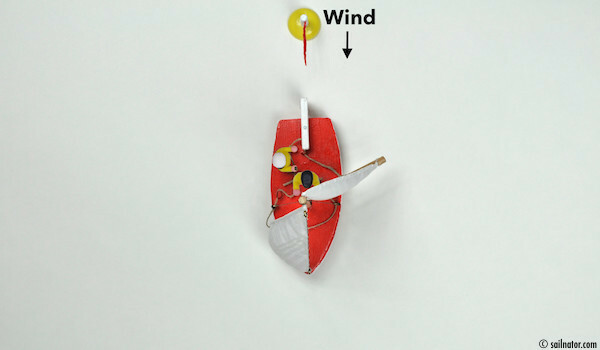 (Figure 12) It creates lift transverse to the direction of the wind. 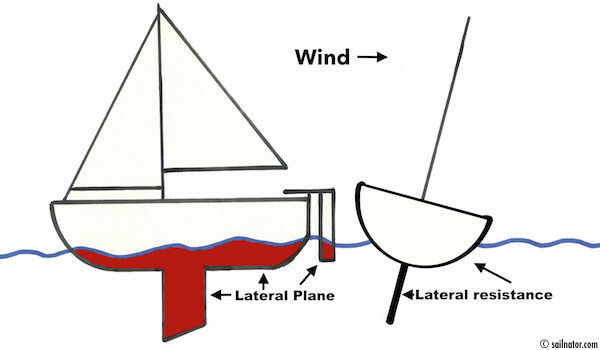 Figure 13: Lateral plane (red area) and water build a resistance, so that the boat transforms the crosswise total force of the lift into thrust and lets it move forward. If you have a look at the total force in figure 14 and 15 and divide it into a parallelogram of forces (one being side force and the other thrust) you can recognise how small thrust forward is compared to total force. Without the lateral plane it would not exist. With its resistance it is underwater transverse to the total force and exploits the fact that resistance forwards is very low. 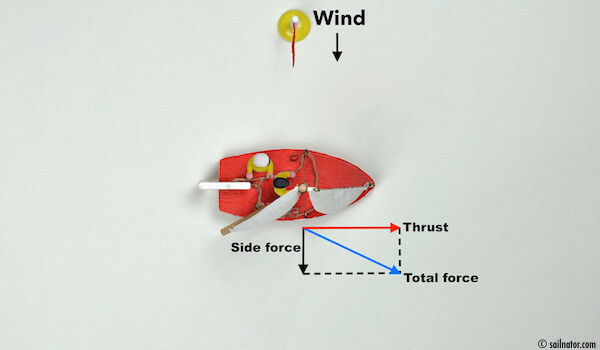 Figure 14: Sailing close to the wind the thrust forward is lowest. 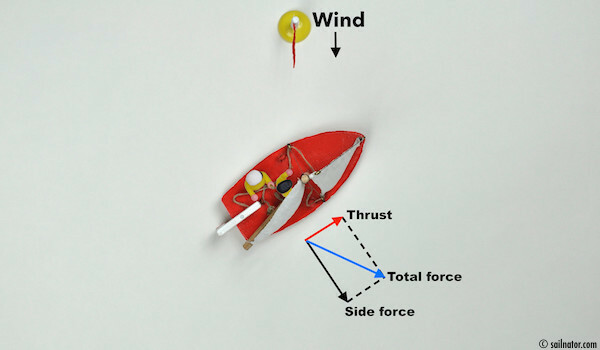 Figure 15: Turns the bow away from the wind the share of the side force declines with less heeling and drift and the share of the thrust forward grows. The more the boat turns towards the wind with its bow the less favourable the ratio between side force and thrust forward gets. The power of the wind gets lost mostly to drift and heeling of the boat. Additionally most of the wind blows over the sails when the boat heels too much. The more the bow turns away from the wind, the less the side force works. Because of that, drift and heeling get weaker and the thrust forward grows. Therefore a boat is sailing the fastest when the wind is coming diagonally from behind. But what actually is wind? Wind is moving air. This movement is a result of difference in pressure. Air moves from areas of high pressure to areas of lower pressure. Warm air rises up and leaves low air pressure, cold air is heavier and condenses. This happens in different places all the time and because of that the direction of the wind permanently changes. The important thing for the sailor is where the wind blows from because he has to trim his sails in relation to the wind. You can establish the direction of the wind by watching flags or wind vanes on the masthead of boats lying still in the harbour. You see it when looking at moving twigs but also by the waves the wind is driving in front of it. The wind we recognise through these indicators is called the true wind. The wind blows in this direction in reality. But is this the wind we sail with … ? You might have guessed that if I ask this way it probably is not. You can observe the true wind only at a location that is not moving. As soon as you move, something you will hopefully do with your sailboat, there is just something we have to add into the equation. Everybody knows the phenomenon from riding a bike: the wind always comes from the front. This is perhaps partly the headwind, but to a large extent it is the wind of motion. And this wind we experience also when we are sailing. Wind of motion and true wind together make up the so called apparent wind. And that is the wind that is actually of any significance for us. Figure 16: The apparent wind always comes further from the front than the true wind. 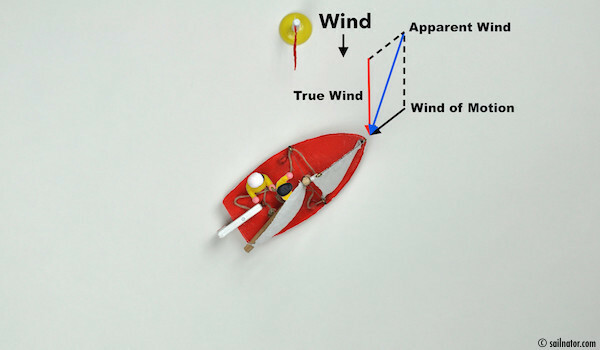 Figure 17: The more a boat bears away from the wind, the weaker the apparent wind becomes. 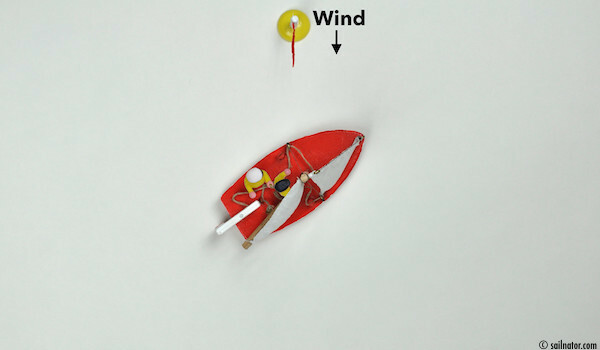 Figure 18: When sailing downwind the true wind and apparent wind have the same direction. 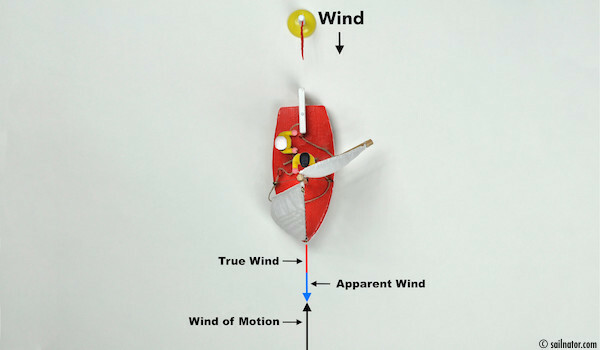 The faster a boat sails, the wind of motion increases and the bigger the difference between the direction of true wind and apparent wind gets. The apparent wind always comes further from the front than the true wind. Except when you sail downwind, with the wind exactly from behind, also called running. Then the true wind and apparent wind have the same direction. The more a boat bears away from the wind, the weaker the apparent wind becomes. The more a boat heads towards the wind, the stronger the apparent wind becomes. Consider figures 16 to 18 for this matter. 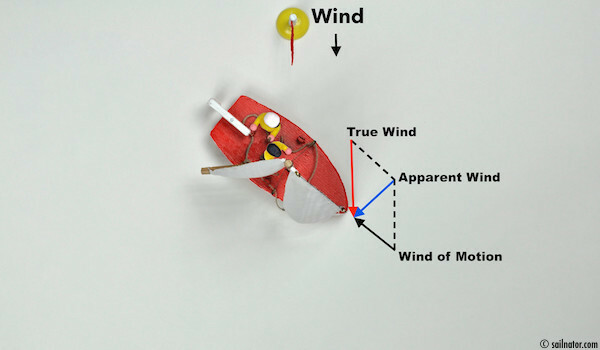 This has given you an introduction to the physics behind sailing. 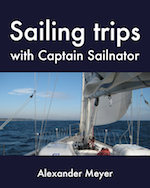 In the next chapters I explain the points of sail to you and the respective sail trim.